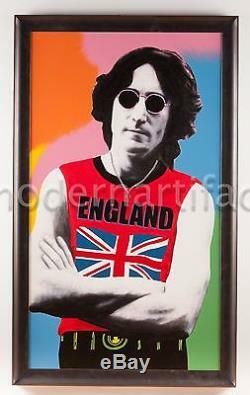 Artist: Steve Kaufman Title: John Lennon Medium: Original Oil Painting on Screen print Canvas Size Framed: 54" x 36" Size Unframed: 48"x30" Edition size: Unique (Kaufman's unique editions consisted of 1-5 of these hand painted screen prints generally). Kaufman did later go on to create a series of this particular print of 10 total that were numbered x/10 This is an Ultra rare image done by Steve Kaufman that is one of one and no others exist in the world. This piece is in great shape and ready to be framed to your liking. As you know Steve Kaufman's legacy has lived on and the rare images like this one create the highest demand for his work. Place your best offer to take this very rare and hardly never seen image done by the great Steve Kaufman. Steve Kaufman is one of the most influential pop artists in U. His work appreciated for both its technical merit and its historical importance in pushing the pop art movement forward. Steve Kaufman single handedly transformed pop art from a discipline focused on ordinary object to art with social relevance. Even by artist standards, Steve Kaufman was an extremely precocious child. He held his first art show at his synagogue when he was only 8 years old, and works from that show are now hanging in the Jewish Holocaust Memorial in Brooklyn, New York. At age 12, Kaufman achieved his first commercial success when he was commissioned to paint custom pet rocks for the New York City Macys department store. Steve Kaufman met the American pop art pioneer Andy Warhol at Studio 54 in New York City. The two soon developed a friendship and working relationship where Kaufman served as Warhols assistant at his famous studio called The factory. Kaufman was heavily influenced by Warhols style. He and Warhol used many of the same mediums including, sculpture, photography, stained glass, mixed media and filmmaking, but his paintings and prints are by far the most famous. He is also famous for painting unusual objects, including Mercedes Benz and a Formula One Race Car. He is famous for painting celebrities including Frank Sinatra, Muhammed Ali, Marilyn Monroe, and Jackie Kennedy. He also produced a very successful screen print series of Cohibacigars that remain some of Kaufmans bestselling work today. Early American pop art focused on making ordinary objects and images into works of art. Critics of pop art have criticized the school of art for being cold and lacking human emotion. While pop art was often injected with a sense of humor and an invitation for the audience to reflect on their value set, there was not much inherent personality in the paintings. Steve Kaufmans art was a pioneer in changing the face or pop art to a more human one with added social relevance. Kaufman was a major advocate for AIDs awareness and one of the recognizable pieces of Kaufman art is his 5 foot by 5 foot canvas of Trojan condoms. He also used his art to promote racial equality and advocate for an end to homelessness. While Kaufman pushed the pop art discipline forward in regards to subject matter, he also pushed the discipline forward in regard to technique. Pop artist has always favored screen printing as a medium, but instead of producing multiple identical prints Kaufman would make each one unique. He would paint something different on each print in a series, making each one identifiably unique. This not only created more value for each print in a series, but it also elevated the print making process to incorporate elements of mixed media. His new techniques couple with his social awareness set Steve Kaufman apart from other contemporary pop artists. At only 49 years old, Steve Kaufman passed away in 2010. Although his art career was short lived, he produced more successful art during his short career than most artists due in lifetimes that are twice as long. Kaufman art continues to be extremely popular. His original paintings and prints can be found in museums and private collections around the world. The item "Steve Kaufman Original Oil Painting John Lennon Beatles Original Unique" is in sale since Wednesday, September 2, 2015. This item is in the category "Art\Paintings".